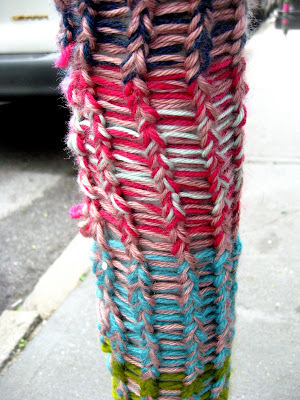 There's not much that's warm and fuzzy about a parking meter, unless it's a parking meter with a hand-knitted muffler. 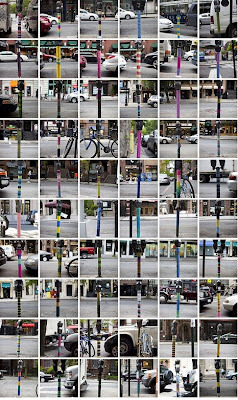 Every parking meter on Montague Street is encased in its own knitted tube until mid-June, an art project of a self-described guerilla knitting collective, founded by artist Magda Sayeg. 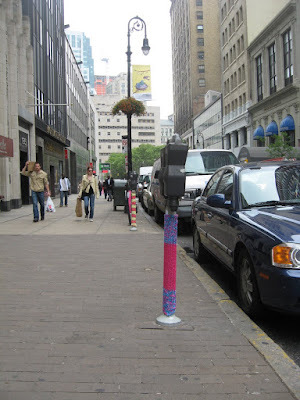 (Gotta love anybody who calls themselves a guerilla knitting collective.) The group has knitted over stuff all over the world, including bricks on top of China's Great Wall. What I love is that the movement started off as a DIY project gone awry - unfinished knitting projects left lying around were converted into door knob covers. 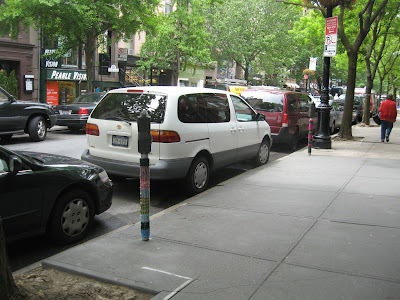 Now they are 'yarnbombing' objects as big as a bus. The Montague sleeves (which the The New York Times calls 'meter cozies') were made by 50 volunteer knitters from around the world. Here's a composite from the Montague Street Business Improvement District Flickr pool.